Indian IT services companies have to worry about rising governmental and social pressures in the U.S. against outsourcing, and rising wages at home, according to P. Sridhar Reddy, CEO of Hyderabad-based CtrlS Datacenters, a provider of data storage services. But there is hope for those who bring value-added services and leverage India’s engineering talent pool, he says. He laid out the pros and cons with India Knowledge@Wharton at the 2010 Wharton India Economic Forum in Philadelphia. India Knowledge@Wharton: Thank you for joining us today. At the [14th Wharton India Economic Forum’s] outsourcing panel, you talked about some of the major trends we will see in India in the coming years. We heard some divergent comments from panelists, some of whom felt that in many segments of the market the [business process outsourcing] industry has matured and that it needs to move up the ladder and introduce value-added services. What is your view? What do you think are the opportunities ahead and what are the concerns? P. Sridhar Reddy: The outsourcing industry during the last decade has seen quite extraordinary growth. Indian companies have grown quarter on quarter. There has been a slowdown in the business during the past one to two years because of the economic scenario. I saw governments putting pressure on companies not to offshore business because of the jobs being lost in the U.S. That has put pressure on the [outsourcing services] industry. I see this as a temporary phenomenon in that over a period of time this will eventually fade away, because American enterprises do need to offshore to stay competitive in the long run in the global economy. But the concerns that I have are that… the government’s economic incentives [to discourage offshoring] will be there for a while. On the other side the costs of the Indian delivery model are going up primarily because of wage inflation. During the past decade or so there has been an average [wage increase of more than] 15% per year, making the cost arbitrage of 1:6 (U.S. wages being six times higher than in India) a decade ago to at best about 1:3 currently. It is likely to go down 1:1.5 making outsourcing not so cost effective in the next five to six years, if the same rate of wage inflation continues — assuming U.S. salaries remain more or less constant. So that coupled with this social pressure on these companies [against offshoring] could make a dent into the Indian software [industry’s fortunes]. India Knowledge@Wharton: A lot of that government and social pressure probably had to do with election rhetoric, right? Or do you really feel that pressure at a firm level? Reddy: I see it. It is there underlying in the minds of most of the decision makers. India Knowledge@Wharton: There have been efforts made by Nasscom (National Association of Software and Services Companies), the Indian software industry’s association, and other government agencies and industry leaders to promote India as a destination for offshoring IT services. Industry delegations have visited the U.S. and made presentations at the World Economic Forum. Has that all yielded any fruit? Reddy: Definitely, yes. Otherwise the situation could have been a lot worse. India Knowledge@Wharton: The fall in India’s cost arbitrage from 1/6 to 1/3 is not across the board. Did you refer to specific segments, or is that an average? Reddy: This is an average figure. Yes, it (the fall in the arbitrage opportunity) could be more in some sectors… and less in some sectors. India Knowledge@Wharton: Surely one of the ways the industry can overcome this is to introduce more value-added services. Reddy: Yes. The model could be [one where] instead of [billing clients] on an hourly basis or a man-month basis, [we bill for] process efficiency. The model has to [reflect] how effective the work is going to be and how it will add a lot of value to enterprises. India Knowledge@Wharton: Which are the industries where you see some movement in this area? We’ve heard outsourcing companies are [moving up the value chain] in pharmaceuticals and legal services — or in knowledge process outsourcing. How much of that is really happening? Reddy: I see good movement in [offshoring of] life sciences — back office work. In legal services, but for a very few small companies, I do not see much of it really happening. India Knowledge@Wharton: In which industries will we see more opportunity for outsourced services in the years to come? Reddy: One thing has emerged as an outcome of global bandwidth prices — especially in India — seeing a substantial drop. It has resulted in new business models emerging. One such is infrastructure outsourcing. That’s what we do at CtrlS Datacenters. And we have seen a great traction in this business model from nearby countries to begin with. The [Persian] Gulf region and African countries are increasingly looking at outsourcing infrastructure to India and to set up even their primary data centers. This IT infrastructure is data centers, primarily, which could be utilized as a disaster-recovery record of the primary data center. 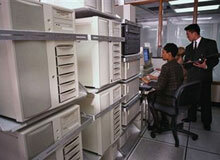 Some American enterprises have data centers across the world. These are large enterprises, mostly in the financial sector, and [they are] now consolidating their data centers — one in the U.S. and the other one in India. India Knowledge@Wharton: Are clients getting more and more comfortable with the capacity in India’s telecommunications industry, the redundancies [in infrastructure] and liability protection? They have had concerns about shortcomings on those fronts. Reddy: Yes, the concerns used to be there as late as five or six years back. But with the multiple links coming into India and almost all the major global carriers setting up their services in India, we haven’t encountered any of those problems during the past three or four years. India Knowledge@Wharton: We have seen a lot of other emerging markets compete with India in recent years and they have grown not only their skill sets but also the breadth of services they offer — China, Vietnam, Philippines, South Africa, some of the Latin American countries. What are the competitive threats to the Indian IT services industry? Reddy: India is uniquely positioned when it comes to the outsourcing of IT and IT activities. It is uniquely positioned because of the talent pool currently available and talent pool in the making. Over two million graduates pass out every year and out of which over 600,000 are engineering graduates. Coupled with this, all of them are English-speaking and most of them are suitable for doing the work; some of them can be trained at very short notice. This makes India a unique place for outsourcing IT services. China, Russia, and some of the east European countries have serious language issues. The Philippines has a cost issue. Even though their accent is very good, they have technical issues in terms of their engineers; their engineering background is not as good as that of the top Indians. For call center activities, some of these countries have priced themselves out — their costs are way above India’s. At the moment, I see India in a great position, but over the years if wage inflation continues and if Indian service providers do not go up a step in the value chain, there could be competition coming from these [other] countries. India Knowledge@Wharton: Many studies have said a large number of these engineers are not really as skilled as one would like them to be. How much of that is true? Reddy: I wouldn’t accept that totally. India has some of the best talent. Take institutions like the IITs (Indian Institutes of Technology) and the regional engineering colleges as well as some of the state government-run universities. The talent available there is world class. The exposure of the students and the facilities there are also comparable to any other university across the world. Now, the expansion of educational institutions to support IT services has been very rapid. That could have resulted in some of the mishaps. India Knowledge@Wharton: What is the impact of the Satyam accounting controversy? That scandal must have really shaken the confidence of many of the Indian outsourcing industry’s clients in developed countries. What are residual effects of that? Reddy: The effect of it on investors has been quite high, especially towards Hyderabad-based companies. Satyam happens to be a Hyderabad-based company. Investor confidence has taken a serious beating. But customers are going to be more choosey. They are likely to spend a lot more time on doing due diligence on the companies to whom they are going to outsource. That makes it a little more difficult for Indian service providers, but it’s not something [that will] have any significant effect. India Knowledge@Wharton: Thank you so much for joining us today.